Goodie! 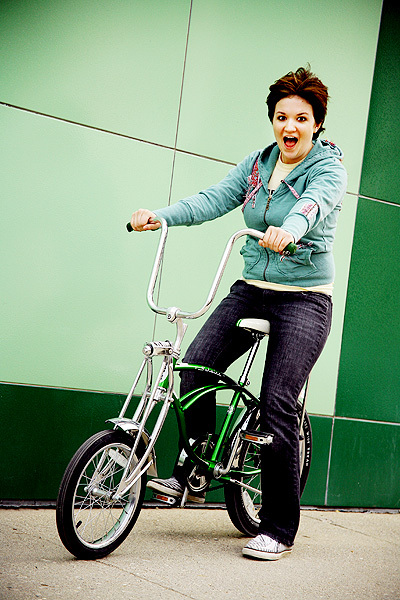 It’s Jeanette… with a bicycle! Jeanette, a friend to O&J and the owner of a new bicycle! This isn’t any bicycle either. This is one of those situations you see in the movies. The situation where a store owner says “I’ve got what you’re looking for in back,” he disappears for a while and then returns with exactly what you were looking for. In the movies though, it’s usually drugs, firearms, potions, dwarves, or knock-off purses. Luckily, this is reality, and not the movies. In reality, when a store owner goes in back, she returns with an astonishingly beautiful bicycle! Jeanette was excited, to say the least. She sped to the FunCenter immediately to show it off (cycling happens to be in her family; her mother is a famous bicycling spokeswoman for a major sports store chain). Queen James just happened to be out and about with her camera, so it was meant to be that she capture the essence that is “Jeanette & Bicycle.” She loves it so, just as much as I love my ’79 Skylark — that’s a story for another time though. Here’s a little tip, if you’re ever going to a superhero presentation and pick up your friend that loves bicycles, MAKE SURE the garage door is closed. Because if it’s not, and it starts to rain, the rain could blow into the garage and get the bicycle damp. Then you’d have to call your mother and make her drop whatever she’s doing and make her promise to close the door. Enough said. Here she is, the lady of the hour with the bicycle of the year :: Jeanette! Next Next post: Yeah Yeah Yeah.